Mexican tiles in Rancherito under sun painting. 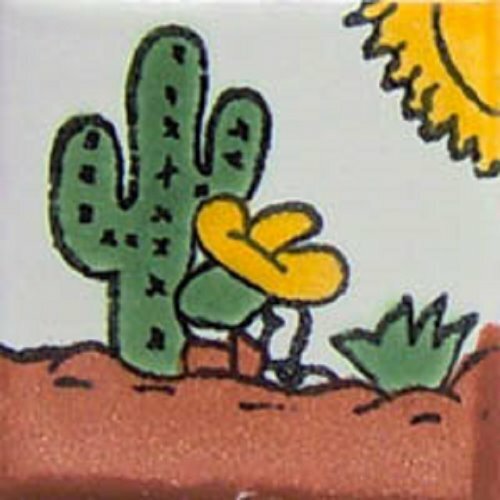 Folk art style design hand painted by artisans from Dolores Hidalgo using yellow, green, terra cotta colors on mosaic tile with rustic crazing white background. Shipping from Mexico to the US and Canada is estimated for four weeks. I purchased six of those ceramic tiles for coasters. We have some Mexican décor in our home and additional accents are always welcome. I decided about rancherito design because it must the most Mexican style I have ever seen. Also, the design corresponds well with colors we use for the room.